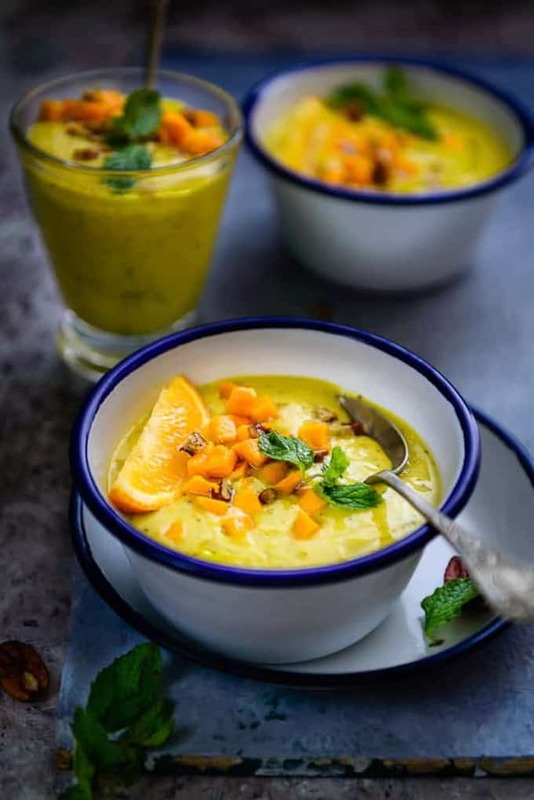 Mango Orange Gazpacho is a flavourful and healthy Spanish dish that is served as a chilled soup. Here’s its quick recipe to make it. Gazpacho is a popular dish that originated in Spain. Served as a chilled dish, Gazpacho is actually a soup that is made using raw vegetables and especially tomatoes as the base. Along with Spain, Gazpacho is even relished with particular fondness in Portugal. It is mostly sipped during summer and going by my experiences, I can say that Gazpacho not only cools you down but it even recharges you. You can make as many variations of Gazpacho as you want by using cucumber, avocados, parsley, watermelon, grapes, meat et al. I prepared my own variation by using mango and orange. Mango and orange being the most versatile fruits have been used by me in countless coolers, milkshakes, salads, and dressings. Hence, when it came to preparing Gazpacho, I straight away thought of making Mango Orange Gazpacho. 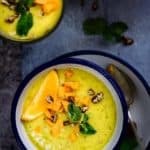 Mango Orange Gazpacho is not at all complicated or time consuming to prepare. With all the main ingredients such as mango, orange, cucumber, onion, mint leaves et al by the side, all it takes is one mix up in the blender with pepper, olive oil, salt, and sugar, that’s it! After mixing and garnishing Mango Orange Gazpacho, I kept it in the refrigerator in order to cool it more. The chilled version of Mango Orange Gazpacho turned to be way more flavourful. I relished Mango Orange Gazpacho with my husband and kiddo with pure joy. 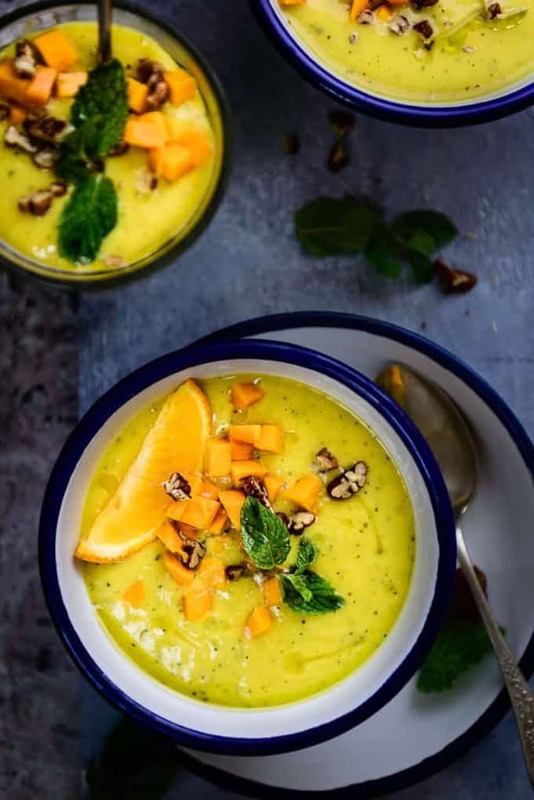 Mango Orange Gazpacho is a flavourful and healthy Spanish dish that is served as a chilled soup. Here's its quick recipe. Add mango, orange and mint in the jar of a blender and blend well to make a smooth paste. Chill for a few hours in the refrigerator. Garnish with mint leaves, mango pieces and peans.